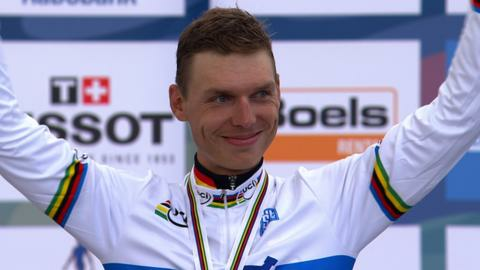 Germany's Tony Martin defended his men's time trial title in a thrilling finish at the Road World Championships. The Olympic silver medallist finished 5.37 seconds ahead of America's Taylor Phinney in 58 minutes 38.76 seconds, with Belarusian Vasil Kiryienka third. Britain's Alex Dowsett was eighth in the race, held in Limburg, Netherlands. Commonwealth silver medallist Dowsett was Britain's only representative in the 45.7km elite men's event following the withdrawal of Chris Froome. The 23-year-old Dowsett, a time trial silver medallist at the 2010 Commonwealth Games, was 2:26.06 slower than the winner, but finished a place ahead of Spain's two-time Tour de France winner Alberto Contador. Martin, 27, overtook Contador - who started two minutes ahead - and led Phinney by 13 seconds after 29.7km of the event, which was staged on a taxing, hilly course. But the German's lead was whittled down to little more than eight seconds at the 38.4km mark, setting up a grandstand finish between the pair, who enjoyed the best of the weather conditions.